Carcinoma of the lung is the leading cause of cancer deaths. The management of lung cancer involved a questionnaire prior to treatment. It contains questions asked when taking a medical history, when forming a differential diagnosis, when choosing treatment, when performing an operation and when planning a postoperative treatment. Physicians who worked on lung cancer, regardless of speciality, are constantly confronted with questions posed from patients, from their collegues and, most importantly, from within themselves. These considerations are behind developing a new textbook of this nature and caused the motivation. The book edited by Prof. Balci provides a broad overview of the lung cancer surgery, clinical and molecular aspects and pathology of it. This textbook is a good resource to pulmonary and critical care specialist and their trainees, as well as thoracic surgeons, oncologists, and pulmonary pathologists. Major objectives are to present a summation of the current knowledge and clinical concepts of the surgical management of lung cancer. The pathophysiological alterations produced and the correction of these by appropriate intervention are emphasized thorughout. Clinical features, pathological changes, surgical management, operative results and prognosis are included as integral part of the book. We are most grateful to the numerous authors who put so many times into writing otustanding chapters. 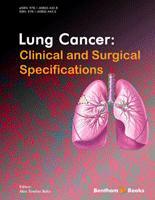 This book includes all the relevant and current information on lung cancer. Much information is completely updated. Although we believe that this book will provide a clear understanding of these manifestations, we invite our readers to inform us about differences of opinion they may have with its contents and areas that need improvment. This book focuses on the lung cancer, which is the mostly encountered, and one of the most challenging malignant diseases of the world. Worldwide, the annual number of new cases of lung cancer is estimated at more than one million and is expected to increase to ten million in 2025. Fortunately, the political efforts to reduce the use of tobacco are getting increasing attention in many countries and the statistics are now showing the first positive results. Over the last decade there have been several improvements and changes in the lung cancer management. Among the epidemiologic changes we see a change in the histopathologic pattern, with a relative decrease in squamous cell carcinoma and a rise in adenocarcinoma. Much research is attempting to identify biomarkers to predict a high risk for developing lung cancer. This will be important for implementing screening and prevention strategies. There is a steady improvement of the overall management of lung cancer based on an increasing use of combined modality therapy, consisting of surgery, chemotherapy, and radiotherapy applied concurrently or sequentially in early stage disease. Furthermore, new techniques are gaining ground, both within surgery and radiotherapy, and targeted medical therapy is being offered to more and more patients. This book is not intended as a comprehensive textbook, but as a concise summary of advances in lung cancer clinical research and treatment for the clinician. The textbook brings up-to-date information about lung cancer, based on worldwide experience, for the use of the many physicians involved in this field. All of the authors have been selected for their expertise and proven achievement in these challenging fields; I would like to sincerely thank all of them for participating with enthusiasm in this project. I hope that the different contributions will help the readers to fill in the gaps and stimulate them for future developments.